As we count down the days to the start of the 2018-19 season, A10 Talk will be brining you its preseason power rankings, as voted on by its team of writers. We begin the countdown with #13 George Washington Colonials. After being named to the preseason All A-10 Defensive Team, all eyes will be on sophomore Terry Nolan Jr. He will be forced into the role that Yuta Watanabe has filled for the last four years as George Washington’s top defender. Additionally, the spotlight will fall onto junior forward, Arnaldo Toro. Last season, he said he wanted to be the most improved player in the Atlantic 10, but ultimately, didn’t quite meet those expectations. 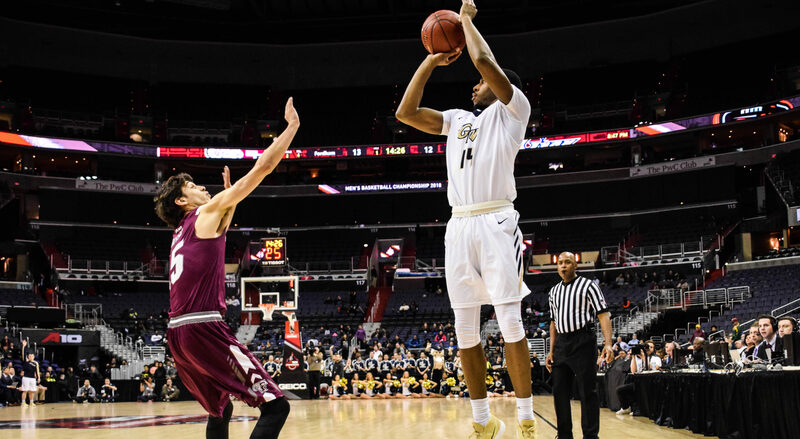 If he can become a consistent force inside, that will give the Colonials a huge boost. Additionally, after taking over the point guard position midway through last season, sophomore Justin Mazzulla will be asked to take a much larger role, especially with the departure of Jair Bolden leaving for South Carolina. This GW squad is as young a roster as I can remember in Foggy Bottom in a long time. There are several freshman and some transfers who will finally get their shot in the spotlight. 6’9 freshman Marcus Littles will be a player to keep an eye on, just because of his height alone. This is the type of player who could easily turn into a Isiaiah Armwood or Kevin Larsen type of player, and the true center that the Colonials were missing last year. Transfers Armel Potter and DJ Williams will also be some interesting names to keep an eye on as well. Say what you will about how bad this team may or may not look on paper: Maurice Joseph knows how to put together a schedule. Right off the bat in November, George Washington will travel to Charlottesville, VA to face #5 Virginia. A week later, the Colonials will face #19 Michigan and then either South Carolina or Providence in the Hall of Fame Tipoff in Uncatsville, CT. Additionally, the Colonials will face a tough test at home against Vermont before travelling to play at Harvard in late December. Expectations are certainly as low for GW as I have ever seen, but there are some interesting pieces here. A lot of guys will certainly be asked to step up significantly from last season, and there are no doubt some very large shoes to fill with in the absence of Yuta Watanabe and Jair Bolden. Say what you will, but this will surely be a battle-tested team by the time A-10 conference play rolls around in January. KenPom has the Colonials finishing 13-17 (7-11 A-10) overall, and that is probably about right. This is going to be another rebuilding year in Foggy Bottom, but if there aren’t some signs of improvement, Mojo may find himself on the hot seat. Still, this is a team that could definitely steal a few wins here and there and could surprise some people.